Carmen, is a real joy with a heart of gold! We are so proud to have her on our team because she is very outgoing and loves people. She is from Rome, GA, but currently resides with her family in Cartersville. She has 3 wonderful children ages 18, 16, and 11. Her favorite motto is “Do unto others as you would have them do unto you”. When she is not working Carmen enjoys spending time with her family and going to movies. One of the reasons she enjoys working for Maid in America is because she gets to meet a variety of nice people. Coming into their homes to clean gives her an opportunity to relieve their stress for at least a day so they can relax and enjoy a little extra time to themselves and with their family. 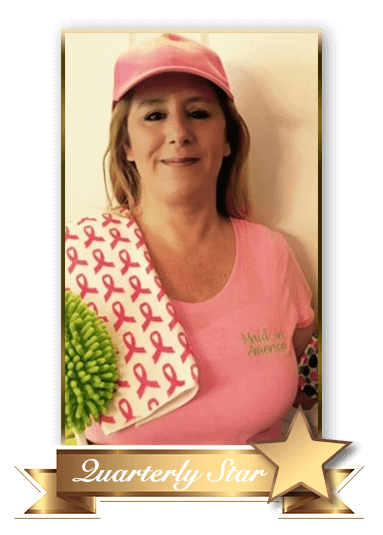 This lady is a true blessing to Maid in America and her clients and we know you will be happy when she is finished cleaning your house! At Maid in America we bring healthy cleaning solutions into your home.